Winemaking. Life. The Dirt. 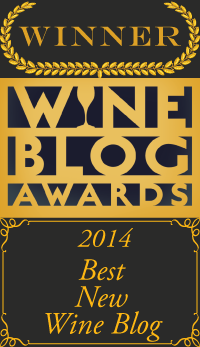 Alison Crowe is a Winemaker Based in Napa. 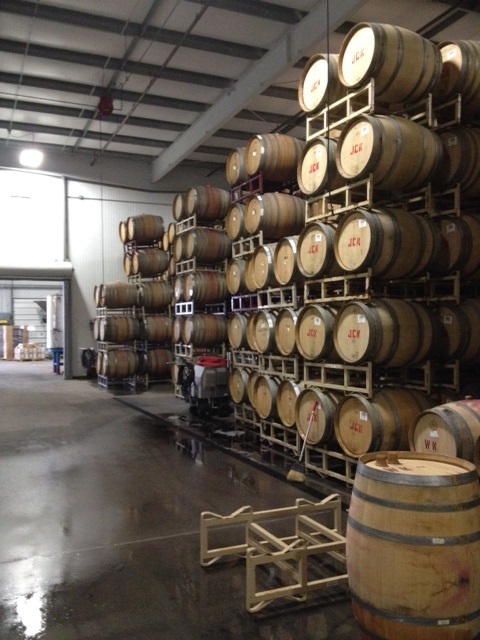 The Garnet Vineyards barrel stacks the morning after the 6.0 earthquake on 8/24/14. No losses. I am grateful and amazed. Driving North from the intersection of Hwy 29 and Silverado Trail, from my office towards my house in the old Downtown, you’d think it was any normal Monday afternoon in Napa. Joggers and mountain bikers fresh from completing their Skyline to Kennedy Park loop trail, flatbeds with grape bins rumbling down the highway, car dealerships with colorful banners flying- all signs of a sunny late-August day in Napa. However, as I approach downtown I can see the yellow caution tape and “Roads Closed” signs at Suscol and First and knots of kids on bikes crossing the now three-sided intersection. Schools are all closed, helicopters slice through the sky and driving by slowly it’s possible to see ugly swathes of plywood slapped across the front of cute Victorian cottages. Stacks of dusty bricks slouch into the street and “Do Not Cross” tape festoons the block like party decorations with a bad sense of humor. It’s definitely not a normal day here in Wine Country. Crying over spilt wine. These broken sample bottles were the extent of my damage. I was lucky. From all reports, however, damage is hit-or-miss. Thankfully, there was nobody out and about downtown and even more importantly, nobody working in the tight barrel stacks when it all came crashing down. 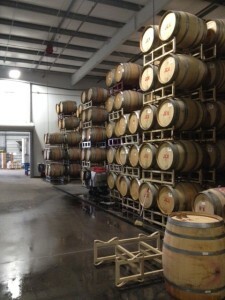 For every winemaker I’ve heard from with barrels on their sides there are five that are reporting little to no damage. I am happy to report I was one of the lucky ones. 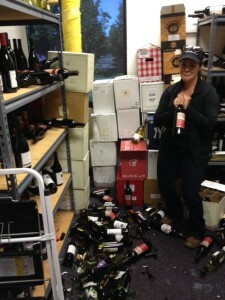 I consult for a number of different brands in addition to being the Winemaker at Garnet Vineyards and between my many tanks, barrels and bottles at three wineries and one warehouse within 10 miles of the epicenter, I lost about 50 bottles of sample wine. I can’t believe it. I also can’t believe my heartache for friends and colleagues who are suffering injuries and losses. I anticipate tomorrow we will know a lot more about the true extent of the losses and now that we’ve all had a chance to clean up the broken glass in our homes and hug our kids (my two are OK), we’re checking winery building integrity, checking in with neighbors and seeing who needs help. There is a Napa Valley Earthquake 2014 page on Facebook where people can list things they need or find help. The city of Napa has a rundown of current red-tag buildings as well as community resources here. The Napa Valley Vintners has been updating reports from their website, with current local industry stats as well as resources for vintners. Many are suggesting that one of the best ways to help us all recover from this terrible event is to go buy a bottle of wine from your favorite local winery. If you buy direct from someone’s website, more of the margin goes directly back to them. I would also add that though the pictures of the damage being reported in the media are very real, Downtown Napa is not a destruction zone. Plenty of hotels, restaurants and businesses are open just like usual and tasting rooms are welcoming visitors throughout the valley. Oxbow Public Market, just steps from the most devastated areas, is serving food and wine to hungry folks just like normal. I hear the Wine Train will be running tomorrow. Friends that have finished up their sparkling wine pressing are opening their cellar doors to help neighbors who may need some spare crush pad space. I’m still reliving the violent shaking every time I close my eyes but I know the chance of aftershocks lessens every hour. I’ve got grapes scheduled to come in Friday. It’s Harvest after all. I think we’re getting back to normal here in Napa. Slowly. Slideshow of Downtown damage by photographer Chris Purdy here.